We're giving away $225 in Kohl's gift cards! Who loves shopping at Kohl's? Who wants to save money while shopping at Kohl's? We're excited to announce our upcoming Kohl's themed Twitter party where we'll be sharing the best ways to save the most money at Kohl's. Join us on Wednesday, February 17th at 5 PM PT/ 8 PM ET to swap tips and learn some new tricks. Prize Eligibility: Must follow @Slickdeals on Twitter. See additional requirements below. Prizes: (1) $25 Kohl's gift card, (2) $50 Kohl's gift card, and (1) $100 Kohl's gift card. All prizes provided by Slickdeals. 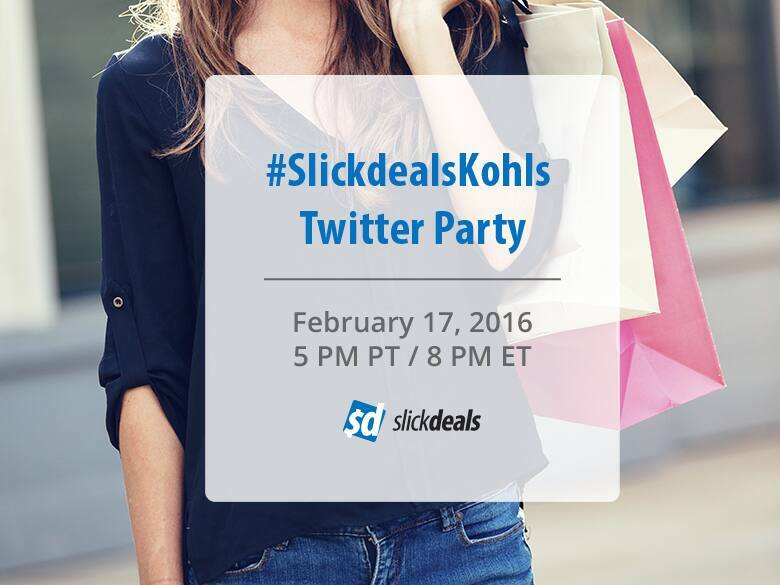 Eligibility: You must actively participate during the Twitter party with the hashtag #SlickdealsKohls on February 17, 2016, from 5 PM PT/8 PM ET until 6 PM PT/9 PM ET. Winners must be actively tweeting with the hashtag at the time they are randomly selected. Winners will be notified with an @ mention, and must respond via DM within 24 hours of being notified. If another winner must be chosen after the party is over, winner will be randomly selected from active participants during the party. There is a limit of one prize per household during the party. Please allow 4-6 weeks for delivery of your prize. NO PURCHASE NECESSARY. VOID WHERE TAXED, PROHIBITED OR RESTRICTED BY LAW. Subject to official rules and open to United States residents. General contest guidelines will be in effect for this event.